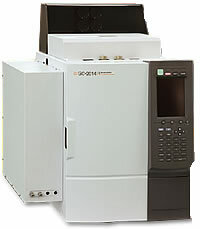 Shimadzu natural gas analyzer (NGA Analysis System) provides a highly flexible GC analysis platform to obtain comprehensive characterization and quantitative information, including hydrocarbon group types of oxygenates and carbon numbers. The methods for determining the chemical composition of natural gases, such as the analysis system and similar gaseous mixtures within the composition range, are shown in the table below. Excellent functions, such as the Digital Flow Controller, have been adopted and the reliability and accuracy improved. In order to obtain excellent retention time repeatability, an advanced flow controller (AFC) or advanced pressure controller (APC) is used to control the carrier gas flow rate and pressure precisely. To keep good peak shape, additional empty pipe, which causes peak broadening, to adjust the time is not required. In order to shorten analysis times, protect the column and prevent contamination in the detector, System GC systems are equipped with the Backflush device. System GC is equipped with software that outputs reports according to ISO, BTU requirements.